Wow! Is the summer moving quickly? Here it is the middle of June and we are finalizing details of our annual educational event. If you haven’t signed up yet, don’t worry, there’s still time. We have some great guest speakers lined up to educate us all this year at the Midwest Coating Seminar from Akzo Nobel, JR Custom Metal Products and WSU/WATC/NIAR. We are planning an all day event (with lunch provided on campus) including tours in the morning (for those interested in learning about an automated powder coating system; contact us for details). The seminar will begin at 10:30 am on September 14th at WATC (Wichita Area Technical College) Main Campus located at 4004 N. Webb Road, Wichita, KS in the Lecture Hall of 300 Building/S Wing. As always, this is a free educational event for custom metal coaters, metal manufacturers, or anyone interested in learning about current coating technology, processing equipment or chemical pre-treatment options, with lots of easy conversation in a relaxed environment! There are multiple inexpensive hotel options close to the technical college (on the northeast side of Wichita, Kansas) for our out-of-town attendees. We hope you’ll sign up to attend and join us for some interesting discussions, free food and drinks. An expert panel will be available at the end of the seminar to answer all of your paint production questions! 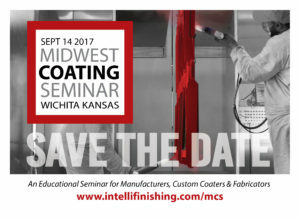 Sign up to reserve your seat today at Intellifinishing – a Complete Paint Systems provider and promoter of educational experiences through networking events.